I heard a scream from my wife in the shower, “No hot water! No hot water! What’s going on? !” Not good. This was 10pm two days ago. My first thought was that the water heater pilot light went out, based on my past experience. What else could it be? I checked that AO Smith Gas Water heater in the laundry room right away. 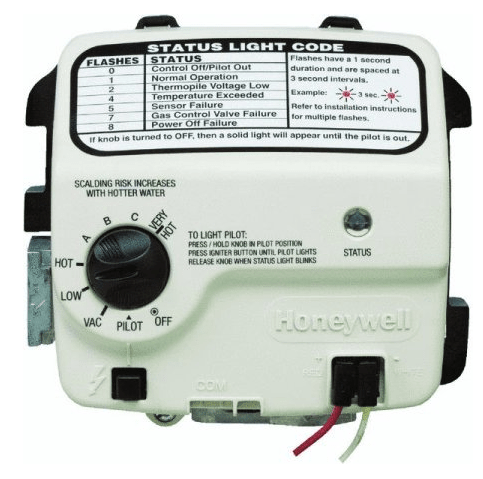 The water heater comes with a sophisticated, advanced Honeywell Water Heater thermostat/valve that provides continuous monitoring of the water temperature and turning on and off the gas accordingly – all without battery. It uses a “thermopile” technology that converts thermal energy into electrical energy. It’s composed of serveral thermocouples connected in series to create roughly 350 mV of energy. What a nifty device! Except when it’s not working. I first tried resetting the module by turning it to off and re-start the pilot light by turning the dial to “Pilot”, holding down “Pilot” and push the spark igniter. The system kept coming back with 4 flashes. Based on the “Status Light Code,” it means “Temperature Exceeded.” It made sense as we had a heat wave recently. So I figured the system should reset itself once the over temperature condition goes away. I kept resetting the system without much success to get the gas burner to turn on again. I googled around and came across this website by Tyler Tork. Wow, so many people had the same problem dating back to 2013. The problem is that the microcontroller inside the unit remembers the last “over-temp condition” and would not forget it. The recommended fix is to disconnect everything from the module for an hour and let the power dissipated to “flush” out the memory. That sounded easy. I tried disconnecting it for 30 minutes. No go. 60 minutes: No go. I left it disconnected for overnight. Still no go. I even flushed some of water out to get the sediments out as it’s a source of heat barrier that contributes to overheating. 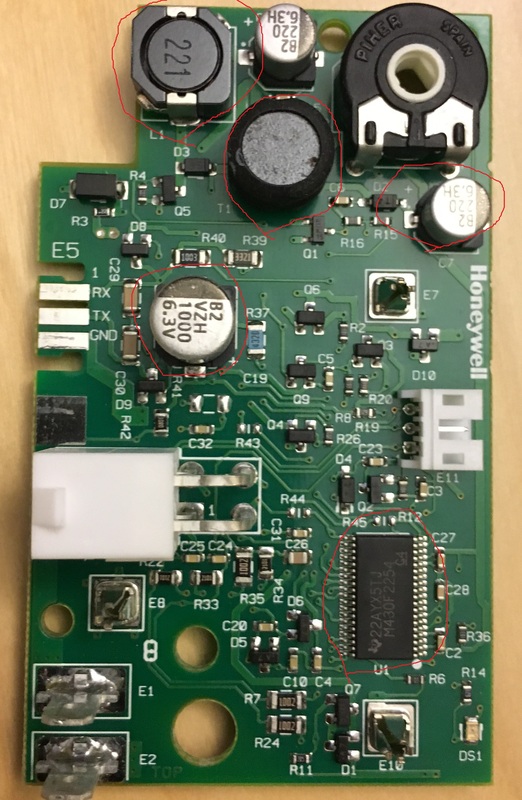 One of the people commented “shorting” everything on the little printed circuit board to really “short circuit” the memory cell, most likely the big capacitors. And that’s what I did, I figured I have nothing to lose as I would need to replace it if it didn’t work. 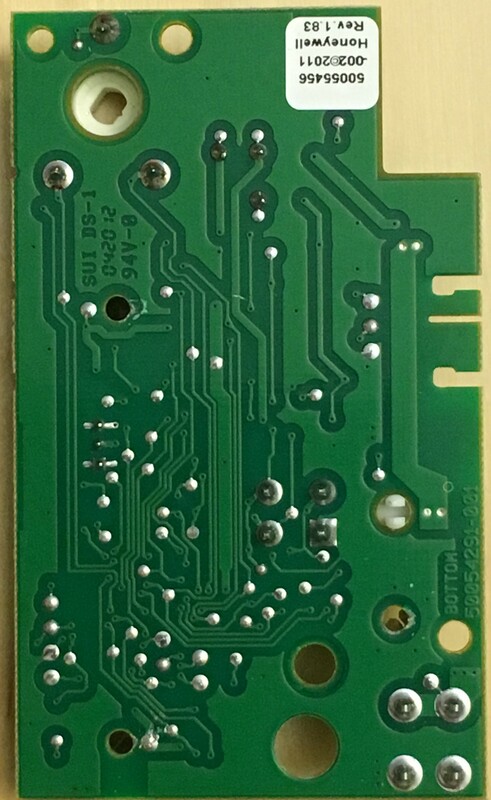 So I removed the PCB (printed circuit board) from its housing by unscrewing the torx screw and snapping the PCB from the housing. Then I took a sheet of aluminum foil (an electricity conducting material) and touch all the various solder joints (silver-looking blobs) especially the big capacitors, which are the energy storage devices. See figures. Then I put it back to its housing and put everything back to its original positions. Turn on the pilot and hit the spark lighter. I first saw the LED flashed 7 times, which means “Gas Controller Valve Failure.” Doesn’t sound good. Then I proceeded to dial it up to temperature setting A. Immediately, the burner turns on and we have a lift off! After a minute or so, the LED started blinking once and paused and blinking once again. This means “Normal Operation.” We’re back in business now. I just saved $110 (Walmart’s price) for the module and enduring days of suffering through cold showers and complaints from my family members. Viva DIY!